PBJstories: How to Stencil your Ceiling–the EASY way! You did such an amazing job! & I must say you are a genius for the tape part! Great job girly!!! 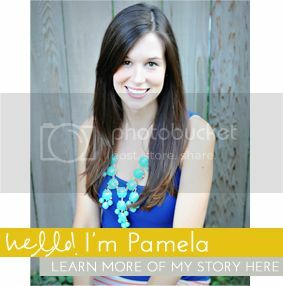 You did such a great job pamela! It was fun to see it all come together! I love how your ceiling came out!! I completely agree about walls not being straight. We have a new home and whenever we try to hang artwork, curtains, etc. we always run into trouble. :) Good tip on taking breaks to rest your neck. I think I'd be scheduling a chiropractor visit right after! Gorgeous!! You did a GREAT job!!! Great job Pamela! You must have wanted to die being 8 months prego doing this!!!!! May I ask where you bought the ceiling light from? I love it!! Looks great! I have to ask though... Do you get dizzy looking at it? Also, does it make the ceiling seem higher or lower? What color are your walls and ceiling? Thanks! They are Cedar Key by Sherwin Williams in Eggshell finish!